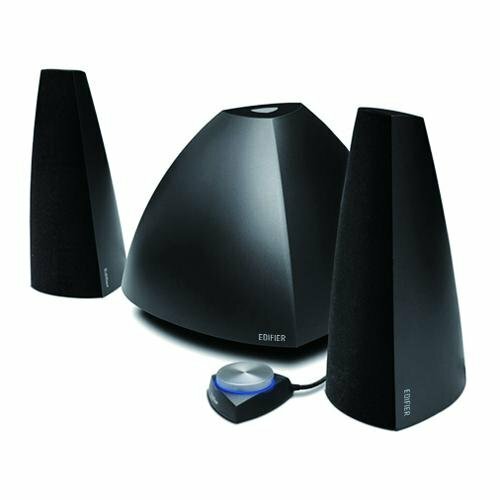 The unique pyramid shape of the Prisma 2.1 Audio System delivers clear and crisp audio from your PC or laptop. The Prisma has been upgraded that turns this award winning speaker system into a must-have accessory for the tech savvy audio enthusiast. This product now features a built-in Bluetooth receiver that can sync with any Bluetooth enabled device to stream music wirelessly within a range of 30 feet. The Bluetooth feature removes the need for audio connecting cables, keeping surface and desktop clutter at a minimum. The down-firing 5 inch subwoofer provides full 32-watts of powerful bass. Each of the 9-watt satellite speakers are enclosed in an anti-resonant composite material, and features a 2-3/4-inch oval mid-range as well as a 19-millimeter PV dome tweeter. All the units are magnetically shielded and offer an impressive 50 watts of total sound. The glossy finish enhances any environment and compliments the latest designs of laptops, desktop computers, and monitors. The installation of this system is as easy as plugging in the included 3.5mm audio cable into your laptop or PC. The wired remote makes adjusting the volume easy and the power can be turned on or off with the simple push button on top of the subwoofer. The Prisma Bluetooth also comes in Silver and White. The Prisma is also available without Bluetooth. If you have any questions about this product by Edifier USA, contact us by completing and submitting the form below. If you are looking for a specif part number, please include it with your message.